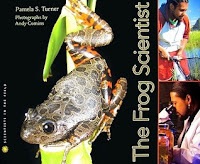 The Nonfiction Detectives: Common Core IRL: In Real Libraries- Frogs! The Scientists in the Field series has made a name for itself as quality nonfiction for middle grade readers. In The Frog Scientist, readers are introduced to Dr. Tyrone Hayes, a charismatic biology professor at UC Berkeley. Pamela S. Turner takes readers into the field as Tyrone and his students catch leopard frogs from a pond in Wyoming. Tyrone is an amphibian expert, and he's testing his theory about how atrazine (a pesticide used in the U.S.) affects the development of frogs. Tyrone's research takes him from the pond into the lab where he and his students care for tadpoles and dissect frogs to examine under a microscope. Turner incorporates sensory details and dialogue into the narrative to make the science story a pleasing read. "This corner of Wyoming seems untouched by humans. The water, air, and sweet-smelling grass are abuzz with life. You wouldn't know it, but even in a place like this there can be pesticides that can harm wildlife" (p. 3). Throughout the book readers are asked to ponder questions and think like scientists as Tyrone searches for answers to how pesticides affect frogs and toads. When the samples from the study are analyzed, the results are "puzzling" which shows readers that science isn't black and white. Often scientists must make adjustments to their theories and try again. The author also provides readers with the pros and cons for using pesticides on crops; this could lead to some thoughtful discussions and debates with students. Stunning, close-up photographs of amphibians with detailed captions make this book a perfect blend of informational text and visuals. Back matter includes a glossary, a page identifying different species of frogs, a list of websites and selected bibliography. Pair this book with The Case of the Vanishing Golden Frogs to compare/contrast environmental and human impact on two different species of frogs. But did you know there is one frog where the male swallows the tadpoles and keeps them inside his vocal sac until they come crawling out, fully developed? Sound weird? 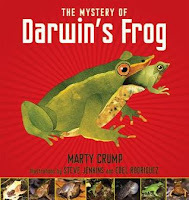 In The Mystery of Darwin’s Frog, behavioral ecologist Dr. Marty Crump, Ph. D. tells of the story of a very unusual frog that lives in the forests near Valdivia, Chile. Rhinoderma darwinni, the Darwin’s frog, was first recorded by Charles Darwin on his now-famous voyage on the HMS Beagle from 1831 to 1836. Darwin saw an unusual frog with a flap of skin on its nose in December 1834, while on the island of Lemuy in southern Chile. A few months later, in February 1835, Darwin sees the same frogs, but this time in a ‘thick & gloomy forest near Valdivia, Chile.’ Darwin described these frogs as “very pretty & curious.” This unusual frog was given its name in 1841. Crump takes us on a 175-year journey and describes in very simple, straightforward language how scientists finally discovered that it is the father, not the mother, who incubates the polliwogs until maturity. The story doesn’t end there. Now Darwin’s frogs, and many others, are being threatened by extinction because of a killer fungus: Batrachochytrium dendrobatidis, or Bd. Bd was first discovered by scientists back in late the 1990s and scientists know of no way to rid environments of Bd. The book is handsomely illustrated with photos, and illustrations by award-winning artist Steve Jenkins, and Cuban-born artist, Edel Rodriguez. The book ends with a glossary, books and websites and a bibliography to learn more, an author’s note, and index. 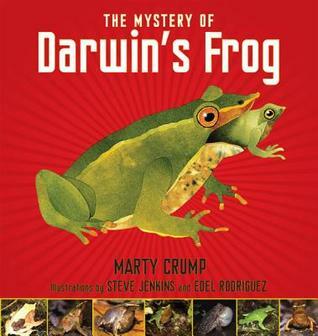 The Mystery of Darwin’s Frogs is an excellent example of quality nonfiction for children. Place The Mystery of Darwin’s Frog in a display with other nonfiction titles: Growing Frogs by Vivian French, Red-Eyed Tree Frog by Joy Cowley, Face to Face with Frogs by Mark W. Moffett, The Case of the Vanishing Golden Frogs: a scientific mystery by Sandra Markle, and Frogs by Nic Bishop. Fiction: Tuesday by David Wiesner, 999 Tadpoles by Ken Kimura, the Frog and Toad books by Arnold Lobel, Froggy books by Jonathan London, Green Wilma by Tedd Arnold, In Memory of Gorfman T. Frog by Gail Donovan, The Fantastic Secret of Owen Jester by Barbara O’Connor, and The Frog Princess by E.D. Baker. These are all wonderful books. Thanks for sharing your ideas.